Want to learn more about our PTA? Please check out our PTA Q&A document. Please go to www.myschoolanywhere.com/join.a5w and look for our Store where you may purchase your membership. If you have not joined MySchoolAnywhere, you will need to input the code ptabobcats to start the registration process. ​If you prefer not to join online, you may send this form and your check with your student. In the spirit of the holiday season and supporting worthy causes, we are seeking grandparents, aunts, uncles or anyone who would love to be a FRIEND OF THE BOBCAT! We have had some grandparents ask how they could support our school given that we do not participate in formal fundraisers (e.g. selling items). Help the PTA fund academic learning tools and get closer to funding capital improvement projects similar to the shaded picnic area that we just completed. This provides the kids a place to have lunch and have special outdoor classroom time. Our next project is to make some much needed improvements to the Kindergarten/1st grade playground! Click around our website to see the wide variety of programs and events that the PTA either coordinates or assists the school with throughout the year. We think it is important for you to know how your contribution is used. Make sure to check out Welcome Brochure! To thank the Friends of the Bobcat who make a donation by November 30, 2017, we will place their names and their students’ names (unless they choose not to be recognized) on the PTA bulletin board in the front office and in the School Yearbook! If you have any questions, please contact SBCEPTA@yahoo.com. ​If your employer has a matching gifts program, doubling your PTA membership donation to State Bridge Crossing can be as simple as filling out a form! Companies from a myriad of sectors and sizes have Matching Gift Programs. 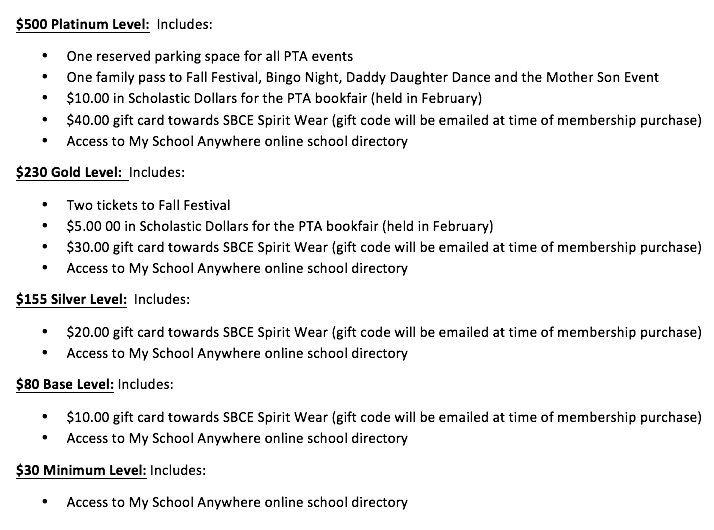 Please consult our informational document for how this program works at SBCE and for a list of companies who have provided matching gifts to the PTA in past years.